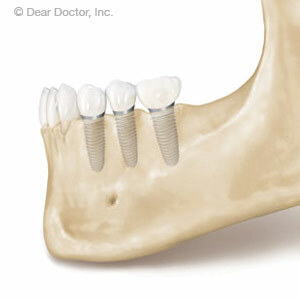 You’ve probably heard a lot about dental implants as replacements for missing teeth. So, why are they so popular with both patients and dentists? While other restorations can mimic the color, shape and texture of natural teeth, dental implants have one clear advantage — and it’s all about the bone. The bone in your jaws provides stability and structure for teeth — without it and the intricate system of gum tissue attachments teeth couldn’t survive the normal biting and chewing forces they encounter every day. That’s why bone health is crucial for maintaining tooth integrity. Teeth also help bone to remain strong and healthy. The forces we generate as we chew transmit through the tooth roots to the bone, which stimulates continuing growth. If a tooth is missing, however, the bone around it doesn’t receive this stimulation and may begin to lose some of its volume and density — up to a quarter of its width in just the first year after tooth loss. This bone loss continues even with other restorations because they’re not able to stimulate bone growth. But dental implants can. This is because the portion of the implant imbedded into the bone is constructed most often of titanium, which has a natural affinity toward bone. Bone cells are naturally attracted to titanium and will begin to grow and attach to the metal surface, a process known as osseointegration. Through osseointegration, the implant develops a durable bond with the jawbone a few weeks after surgery that surpasses other restorations, and is a prime reason for their success rate. Although installing implants can be an expensive undertaking, their proven longevity may result in less maintenance, repair or replacement costs over time than other replacement options. If you’re considering dental implants, remember it’s what you can’t see beneath the attractive crown that makes them special. And it’s a choice you can depend on to provide you a beautiful smile for years to come.